NAHA, Okinawa Pref. 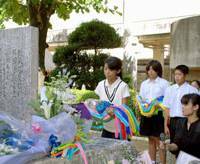 (Kyodo) A memorial service was held at a public elementary school in Uruma, Okinawa Prefecture, on Tuesday, the 50th anniversary of a U.S. fighter jet crash that killed 11 students and six other people in the neighborhood. On June 30, 1959, an F-100 on a test flight from the U.S. Kadena Air Base in then U.S.-occupied Okinawa developed an engine fire and crashed into Miyamori Elementary School and nearby houses at lunchtime. In addition to the 17 fatalities, 210 people were injured, including 156 students. The pilot ejected and was unhurt. The accident prompted fresh ill feelings toward the U.S. military in Okinawa and led to mounting calls for the prefecture’s reversion to Japan, which came about in 1972. Okinawa Gov. 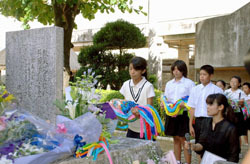 Hirokazu Nakaima, former students and relatives of the victims were among the roughly 800 people who participated in the service. After some current students laid flowers and paper cranes at a stone statue built in 1965, a “peace bell” was rung and the participants offered a silent prayer. “The Okinawa people of the time were deeply saddened by the accident in which the lives of children having dreams and hopes for the future were lost,” Nakaima said in a speech.